Your support provides hope, encouragement, and financial support for Santa Barbara County’s deserving students. If you prefer to mail or fax a gift to us, click here for our Printable Form. The Scholarship Foundation of Santa Barbara is committed to following best practices for privacy. We respect donor privacy and do not sell or share donors’ personal information. Give Unrestricted Contributions: Your gift will be used where it is needed most. 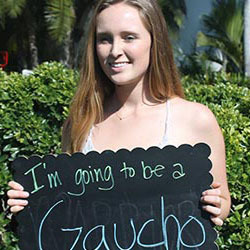 Establish a named Annual or Endowed Scholarship Fund: The Scholarship Foundation of Santa Barbara manages scholarship funds for individuals, families, business, foundations and civic groups, starting from $2,500. Name a scholarship fund and support deserving undergraduate or graduate students attending vocational school, two-year colleges, or four-year universities. You may choose a name for your fund and establish preferred criteria for student recipients. Each May, you will receive a letter describing the student(s) we have selected for your scholarship award, keeping you closely tied to the impact of your gift. Support the Financial Aid Outreach & Advising Program: Your donation will help provide workshops and counseling sessions for students and families who may need assistance to find all sources of financial aid. Become a Member of the Scholars Circle: Choose the Scholarship Foundation as a beneficiary to provide a lasting legacy. These gifts are important because of their permanence; planned gifts to establish endowed Scholarship Funds will continue awarding scholarships in your name in perpetuity. Unrestricted gifts provide the financial infrastructure to keep the Foundation growing. Unrestricted gifts provide the financial infrastructure to keep the Foundation growing. For more information on giving to the Scholarship Foundation of Santa Barbara, contact Nicole Jones, Donor Relations Manager, at (805) 687-6065 or by email.